Near the Bay... a Great Getaway... Visit Us Today! 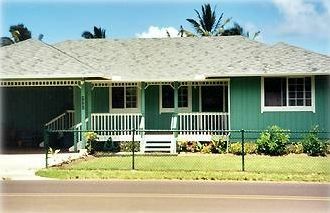 TVNC-1198 / Tax ID# TA-140-845-6704-01/GE-140-845-6704-01: Walking distance to beautiful Hanalei Bay or to quaint Hanalei Town, our one-story 1100 square foot vacation home offers you the best of both worlds. Surrounded by the peace and quiet of our neighborhood, relax on our back lanai to discover the beauty and splendor of the North Shore of Kauai. Hanalei features lush valleys and mountains with cascading waterfalls as well as picturesque Hanalei Bay and historic Hanalei Pier. Hanalei Bay is a stunning two-mile stretch of white, sandy beach, where whales and dolphins can be seen. You can witness a magnificent rainbow during a sunset stroll or picnic on the beach. During the summer season, the Bay offers kayaking, snorkeling, swimming, and seemingly endless sunshine, while the winter season is famous for its powerful and breathtaking surf. Browse through quaint Hanalei town, with its various specialty shops and art galleries. You can also sample a variety of our 'local' foods and talents at the many eateries Hanalei Town has to offer. Visit the world-famous Hanalei Valley, a US Fish and Wildlife Refuge - home to many species of birds, some endangered, as well as being the largest area of taro grown in the state of Hawaii. There are so many things to see and do on Kauai. The west side features Koke'e State Park and Waimea Canyon (the 'Grand Canyon of the Pacific'). The South Shore boasts the Spouting Horn and the Tunnel of Trees. On the east side, there is the Wailua River and the lush, fern-covered cavern of the Fern Grotto. The North Shore's majestic cliffs of the Na Pali Coast and numerous beaches for snorkeling and surfing all waiting to be discovered. Owned and managed by William Haraguchi & Family, local residents who have lived on Kauai for generations, who can be personally contacted at (808)826-6459. Centrally located in Hanalei town, 4-5 minutes walking distance between the white sands of beautiful Hanalei Bay and quaint Hanalei town with its various shops and eateries. Comfortable home with a covered lanai to relax or dine after fun-filled days of activities. Also have an outside shower. (6) Seat dining set inside; (4) seat dining set on lanai. Quiet neighborhood; walking distance to beach or town. Relaxing, close to the beach...4 houses away...close to town...about the same! As a family of 4 with two teenage girls we so enjoyed our time staying in Hanalei. Three bedrooms and 2 bathrooms gave us lots of space and was so clean and tidy. Cathy and Glenn, the long time Hanalei residents/owners of the cottage, live next door and were so welcoming and kind! They even shared taro and fresh cabbage from their garden. What a treat! Everything we needed was there, from beach mats, chairs and towels to any kitchen items you may want. You don't need to get in the car at all to enjoy all that north shore Hanalei life has to offer! Thank you so much for sharing your home with us Cathy and Glenn! We can't wait to return! We Had The Best Time!! A lovely home in a lovely town. ALL of the things that you could imagine that you would need for your vacation is in this house. We loved the layout and we loved our hosts who lived right next door. I can't wait to return. Fabulous House, Location and Owners! We stayed here, 6 houses from Hanalei beach, and had a blast! VRBO requires me to say it was this year, but it was actually a few years ago. The friendly and hospitable owners next door shared exotic (to us!) Japanese veggies from their garden, and taro - fresh from the fields. A beautiful landscaped backyard with lanai and outdoor shower made for a very homey feel. It's on the quiet side of the island, and a short drive to the Napali coast trails. Downtown Hanalei is a one minute walk, where we loved the bookstore, restaurants and a wide variety of shops. We had the time of our lives and want to go back. The air and water are so soft!